How to install the plate "Tricolor"
The anchor plays a very important role regardless of what element of construction it is a machine that is installed on a concrete floor or boltsevye ladder mounted on the wall. It provides communication with the base, and if this relationship is fragile, the construction threatens the destruction, no matter how durable on the inside it was not. To be safe, the anchor should be set, following a particular technology. Chemical anchor is very durable and reliable. It can be installed in any material: brick, stone, cellular concrete, wood, etc. Since it's mounted with adhesive, it not only weakens the base, which is attached to, but in many cases makes it even stronger. To install anchor, drill a hole the desired diameter at the desired depth. Clean it with the brush-brush, blow pump or a pear. Fill 2/3 of the hole of the adhesive mixture of epoxy or polymer resin. A container of adhesive (cartridge) can be decorated differently – a syringe, a tube, etc., Different methods of mixing the components of the adhesive. Whatever the embodiment, the adhesive cartridge, you need to act strictly according to instructions attached to the product. Twisting motion, install the anchor into the hole to the full depth. Remove drips of glue from the base. Time readiness anchor to the perception of stress depends on the brand of glue, it is specified in the instructions. After the specified time, the anchor can be fastened to any design. Mechanical anchors are installed without glue. The principle of operation is based on the wedging of the sleeve anchor within the hole, and thus a reliable fixation in the base. Drill and clean the hole the same way as described above. Through the mounted item, insert in hole wedge anchor and hammer it with a hammer until the nut abuts in fixed detail. Tighten the nut with a necessary (but not excessive) effort. Over tightening the end anchor rasklinivat sleeve and securely fixed in the hole. Ways of wedging may vary. If it is a special rod that is inserted inside the anchor, then after the installation of the bolt in the hole and hammer the rod with a hammer inside. Thus, you will ruskinite the bushing and lock the anchor in the hole. To install wedge anchor with internal thread, special tools are needed – a rod, similar to a center punch or a piercer. After install the anchor into the hole, place the tool inside and hammer rackline sleeve. Then remove the punch-piercer and screw into the threaded hole anchor mounting screw. The so-called frame anchor has two rasklinivanija zone in the base and anchoring details. The frame and hammer the anchor into the ground via a dockable item. Tighten the screw with the required effort. In this first raskinetsya lower in the base part of the anchor, then the top, in detail. In the result, the latter will be firmly attached to the base. Purchase products use very convenient, especially if you have to install a large number of anchors. However, if necessary, can be firmly fixed in any ground, and improvised explosive device – a bolt or rod of any kind. Drill a hole with a diameter of 1-2 mm larger than the anchor diameter. Well clean the hole from dust and crumbs. Fill the hole halfway or a little more epoxy or putty with hardener. Rotational motion and easy blows of a hammer, install the anchor into the hole. Remove drips of resin. Some time later, when the epoxy a bit (but not completely) harden, flatten it around the anchor flush with the base. To use this anchor in about a day. Anchors exist in different versions, such as: anchor bolt (or anchor bolt, which is also called wedge anchor or wedge anchor), anchor drop, the anchor frame. Then in this hole is screwed a nut or bolt. In the case when the nut is screwed, the rod is pulled out. It is possible to fasten another part. In cases where the bolt is screwed, the rod remains inside. How to fix anchor bolt in the wall of concrete and brick? The process takes a little time for the task You will need a drill, hammer, anchor bolt. Ensure in advance the material that will be attached to the bolt was not loose. 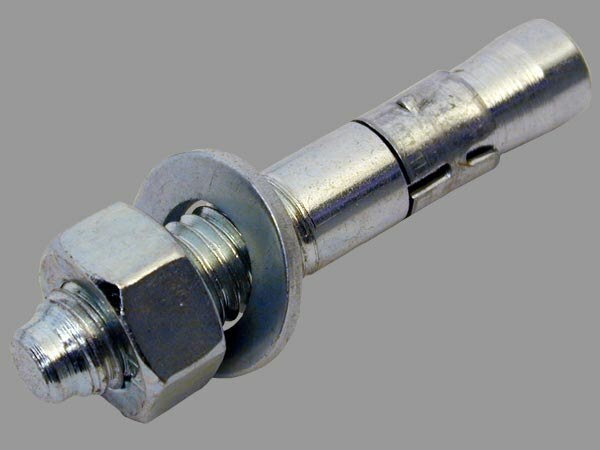 Anchor bolt with nut — the principle of operation is the same as the regular anchor, added a thread that comes out when you twist the head of the bolt.